In order to better serve our customers, we have separate email addresses for specific needs. 1. To make changes to an existing web order before it ships. Also, for discrepancies and picking errors with orders you have received. These emails are checked constantly, throughout the day, Monday through Friday. 2. If you are ready to place a web order, but need more information about a product on our website, use this address. Also for any web store related questions. 3. For customers who plan to visit our brick & mortar shop and have questions about bicycles, accessories, trailers, helmets, etc..
4. For info on Rivendell and Gunnar bikes. Also Brompton folding bikes and Lighting equipment. We are one of the few online bike shops offering a wealth of free information and free email advice. Some of the larger online stores even refer their customer inquiries to us. Take time to thoroughly research our website before contacting us. Answers to most questions can be found on this website or other bicycle forums and blogs. If your question starts with "Your website says ..." chances are you already know the answer. Please use our Secure Online Shopping Cart when you are ready to place an order. Next to each item on this website is one of the Shopping Cart Buttons shown above. Clicking these buttons will lead to our Secure Online Shopping Cart. NOTE: By clicking the button, you are not obligated to purchase the product. The button merely takes you to another page where you can buy the item, choose shipping options and proceed with the checkout process. You can also go directly to the catalog in our shopping cart site. This contemporary site is auto-updated on a daily basis and has "Out of stock" notifications. Email is the prefered method of contact for parts inquiries and technical advice. A detailed email will give us something to go back and refer to. Note: Please do not call the brick & mortar number for web-related inquiries. This number is only for customers who plan on visiting our shop in West Newton, MA. We follow B.O.B., CRW, Massbike, Moulton, Tandem and Touring email lists, among others. Is everything in stock? We pride ourselves in trying to keep everything with a shopping cart button in stock. We do not have a 'live' online inventory, but we manually update stock status on a daily basis. Click on the cart button of any item. Out-of-stock items will have their shopping cart disabled. Otherwise, the item is very likely to be in stock. You can check the status of your order using the link in your order confirmation email. Note: This does not apply to items from the QBP/Special Order Catalog. When will my order ship? For orders where all items are in stock and shipped via UPS, we ship the same day they come in (excluding weekends). The cutoff time for same-day shipping is 4pm Eastern time. The exception is orders shipped via US Postal. These orders take an extra day or two to process. Does Harris accept backorders? We do not take backorders for items that have the shopping cart disabled. Can I place a special order? Yes! You can search over 30,000 items in our QBP/Special Order Catalog. You can add these items to your online order, along with stock items from our warehouse. We will ship your complete order when the special order items arrive. Click here for details. Note: Special order items will display with "QBP #" in your shopping cart. Our Web store does not offer special order items from any other suppliers or manufacturers. Special order items are not returnable, unless they are defective. What is my shipping cost? After you've finished adding items in the online shopping cart, please proceed to the next screen and enter your address and choose a shipping method. The shipping cost will be calculated automatically. Our FAX is on automatic, yours should be too! FAX is our least favorite communications medium. Please don't use FAX to ask questions that require a response. 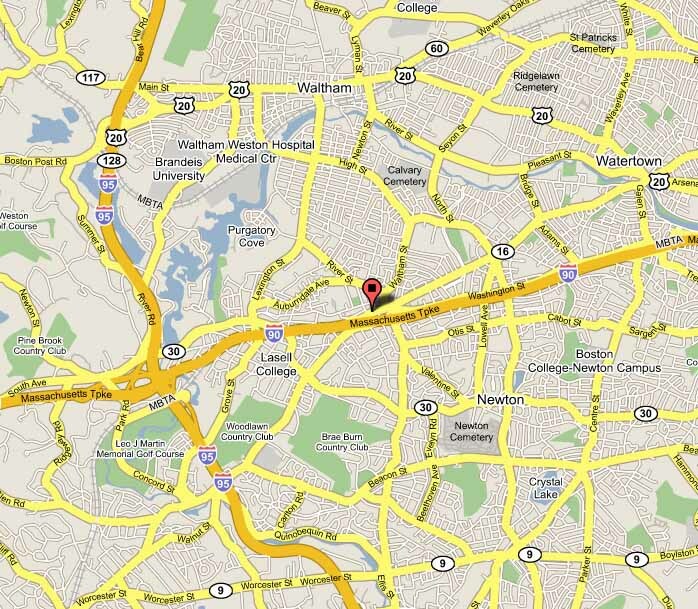 We are located on Route 16 (Washington Street) in West Newton Square, about a mile and a half in (East) from 128/95, just after Route 16 crosses the Mass Pike. If you are coming from the west, we will be on your left. From Boston by car, take the Mass. Turnpike to exit 16 (Newton Corner) then continue straight on Washington Street next to the Turnpike for about 2 miles. West Newton Square is where Route 16 merges in from your right, we are two blocks past the merge, one block past the police station, on the right. There is a municipal parking lot behind the shop.